From Krabi the sea journey takes 1 hour 30 minutes to 1 hour 45 minutes depending upon which ferry service you use. All ferries from Krabi to Koh Phi Phi go to Ao Tonsai Pier on the south side of the island. Travel Tip: If you are planning a trip to Thailand it is worth remember that the ferries from Krabi to Koh Phi Phi are 150 to 350 THB cheaper than the ferries from Phuket to Koh Phi Phi. From Bangkok you are better off travelling to Koh Phi Phi via Krabi rather than travelling via Phuket. There are three companies with daily ferry departures from Krabi to Koh Phi. Songserm, Andaman Wave Master and Chaokoh Ferry services depart from the Klong Jilard Pier near Krabi Town. Use the search Box below to find tickets from Krabi to Koh Phi Phi. Ferry services to Koh Phi Phi depart from Klong Jilard pier (also sometimes written as Klong Jirad pier) is 3.6 km south of the centre of Krabi town. It can be reached from Krabi town either by shared taxi, departing from Soi Maharaj near the Vogue Shopping centre, or by taxi. If you are going to travel direct we advise that you allow at least 90 minutes between the time your flight is due to arrive at Krabi Airport and the time the ferry departs. 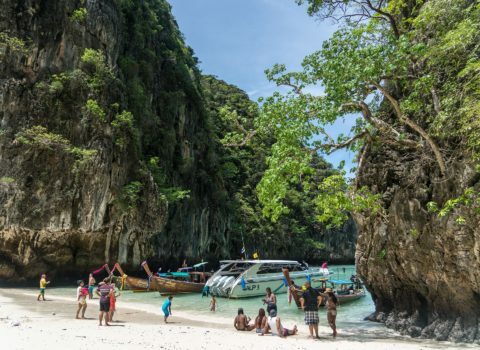 This means that if you plan to take the 10.30 ferry to Koh Phi Phi your flight needs to arrive at 09.00 at the latest and if you plan to take the 13.30 ferry then your flight needs to arrive at Krabi Airport by 12.00. Both the Andaman Wave Master and Chaokoh Ferry services take you to the same place, which is Ton Sai Pier on Koh Phi Phi island. Ton Sai Pier is located on the short stretch of concrete road in the centre of the island. Most of the resorts and other amenities are clustered in this area as well so it is a good arrival point. Koh Phi Phi is not a large island which is part of its charm. If you are staying in the north of the Island then you might consider taking a taxi boat there from Ao Ton Sai.